My family’s pretty much a Thanksgiving apple pie family. But since the fella (yes, Ray is his name, let’s get that out there) became part of our lives, I’ve added something pumpkin to the rotation — whether it be cheesecake, pie, or bread pudding. 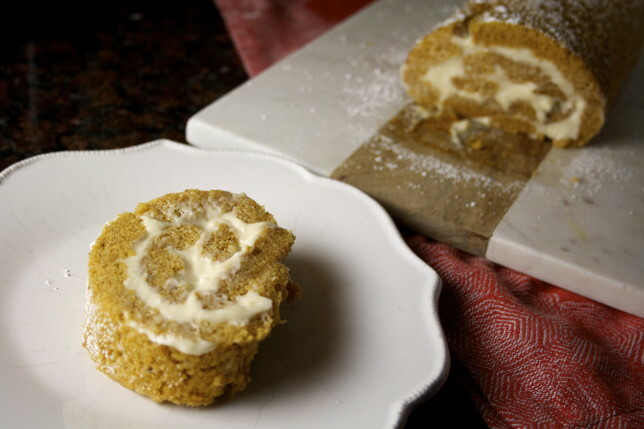 Pumpkin lends itself to easy desserts. This is no different. The cake is essentially a lean cake, meaning there are no fats except for the egg yolks, baked thin in a baking sheet. 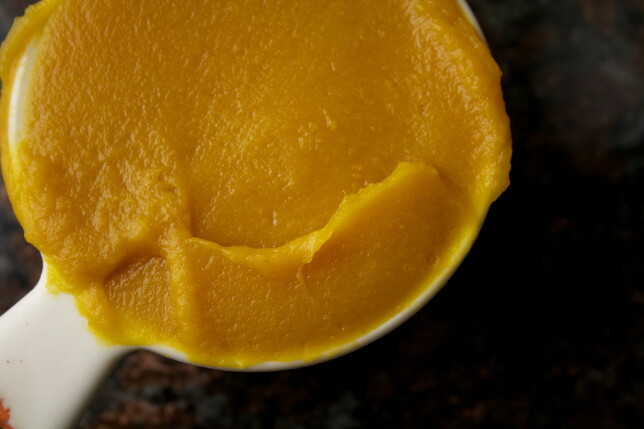 Three eggs are whipped up with sugar and pumpkin, and a spiced flour mixture — a comparatively small amount, combined with your typical pumpkin spices — is mixed in. 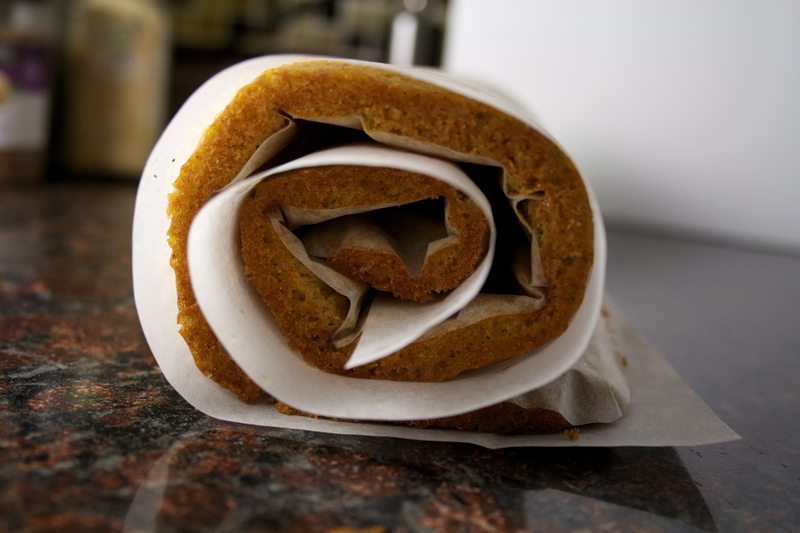 Once out of the oven it’s rolled between sheets of parchment and left to cool in the rolled position. Think of it as muscle memory, or, more appropriately, since it springs back when it’s ready to be taken out of the oven, memory foam. 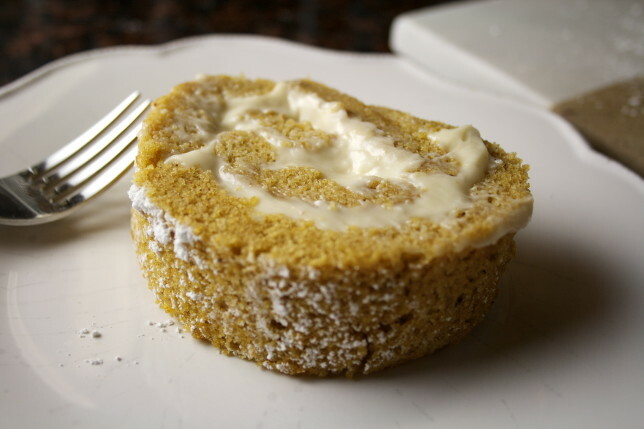 The cake cools knowing it will be rolled, so when you unroll it to fill it with your maple cream cheese filling, it eagerly awaits being re-rolled without cracking. And if it does, like mine did, perhaps because it stuck to the parchment, fudge it — a dusting of confectioner’s sugar over the top covers it beautifully, like an early light snowfall. Don’t fear it. Become one with the pumpkin roll. 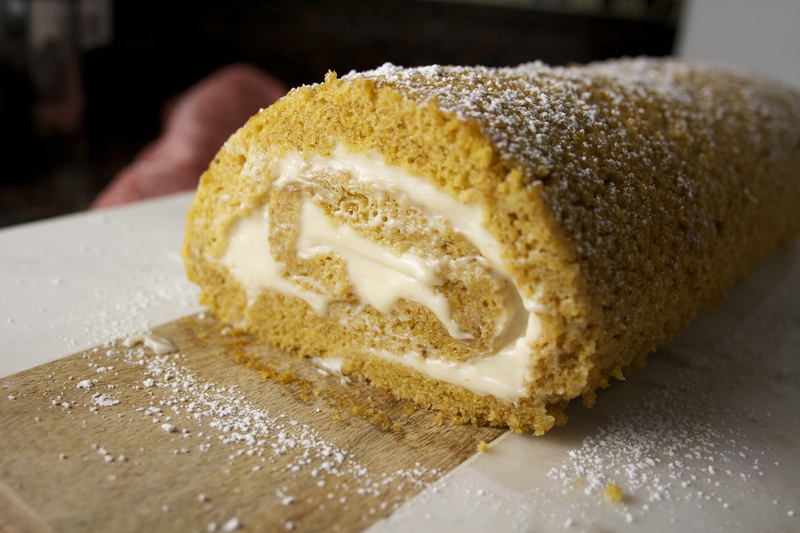 The result is a light and airy pumpkin cake swirled with rich, creamy, cream cheese filling. The maple complements the spices. It’s warming. It’s truly of the heart. And even better after it’s been refrigerated, making it the perfect dessert for your Thanksgiving feast — make it the day before, or even two days before, and pull it out of the fridge when the coffee’s done brewing. This maple pumpkin roll will probably make several more appearances over the next few months — and the next many, many years. What better to warm us through that long, wonderful journey? Preheat oven to 375 degrees. Grease and line a 10 x 15-inch baking sheet with parchment. In a small bowl, whisk flour, baking powder, salt, and spices. Set aside. 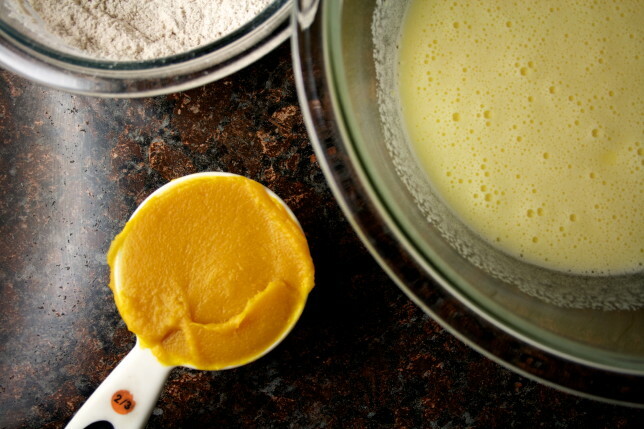 In a large bowl, beat eggs and sugar with a hand mixer until thick, fluffy, and light in color. Beat in pumpkin. Add flour mixture and mix well. Pour into the prepared pan and spread evenly. Baking for 14 to 16 minutes until the top springs back when lightly touched. Remove from oven and let cool in the pan for 2 minutes. 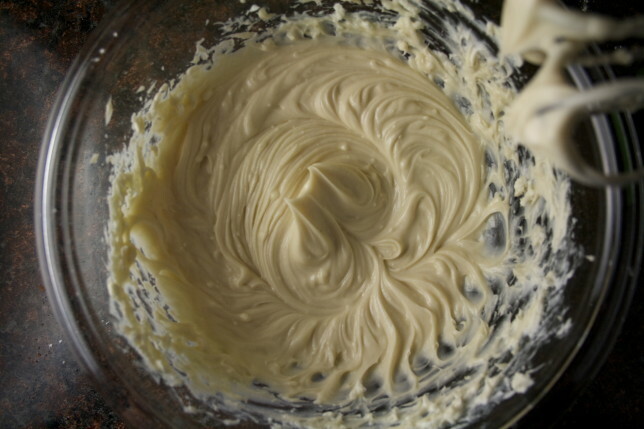 When the cake is cool, make the filling: mix the cream cheese and butter until well combined. Add maple syrup, confectioner’s sugar, and vanilla and beat until light and fluffy. 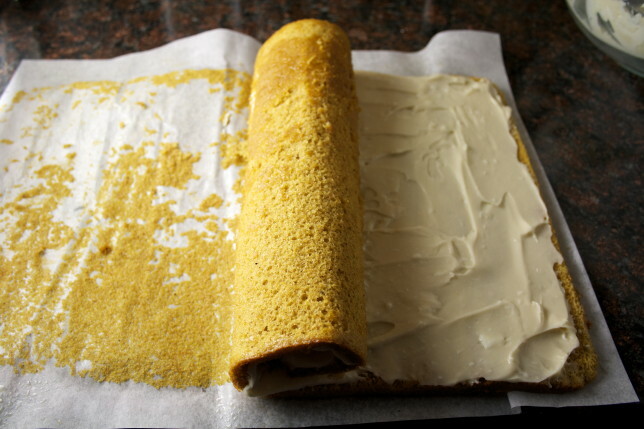 Carefully unroll cake and spread the filling over the top. Re-roll, pulling away the bottom parchment, and place seam-side down on a serving plate. Trim the ends. Dust with confectioner’s sugar and serve.